Mac and cheese meets pasta salad in this zesty macaroni and cheese filled with Tex Mex flavors and bell pepper crunch! Disclosure: This post is sponsored by alli®. All thoughts and opinions are my own. 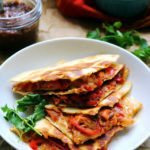 For more great recipes visit https://www.myalli.com/recipes-for-you/. Can we all just agree that mac and cheese nights are absolutely, without a doubt the best nights? 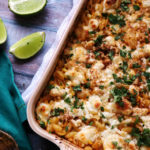 I think happy thoughts every day that somebody somewhere will find a way to make a crazy indulgent mac and cheese that is actually calorie free so I can eat it on a daily basis without my thighs hating me….but until then, allow me to introduce you to this Zesty Macaroni and Cheese!!!!! AKA – the next best thing. 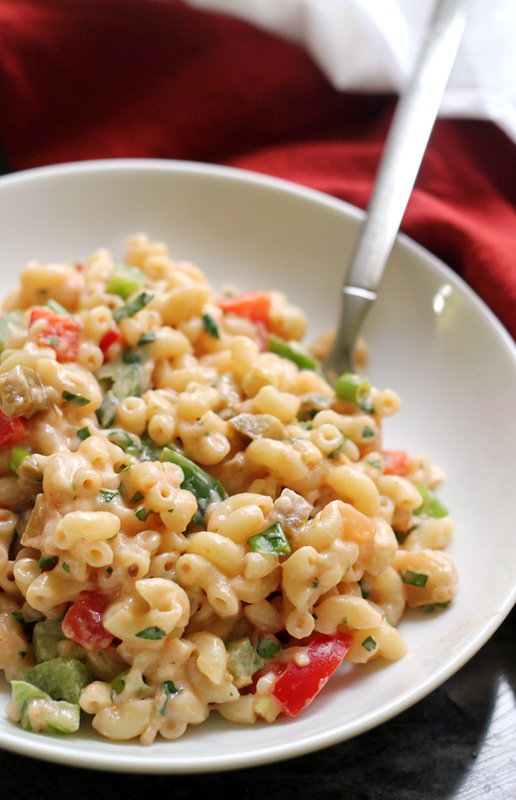 This is basically what would happen if mac and cheese and pasta salad had a love child. FYI. 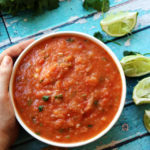 Cute little elbows are tossed with a sour cream-salsa sauce that somehow manages to be both creamy and fresh in every bite. A rainbow of bell pepper cubes are mixed in for crunch, while grated cheddar cheese makes it just the right bit of indulgent. 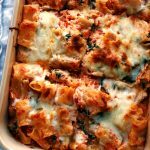 Personally, I added the cheese while the pasta was still hot so that it could get all melty-like, but you could also veer further down the pasta salad path and allow it all to come to room temperature before mixing. Party in your mouth with every bite?! Um, yes. Basically, I’m seeing an excess of mac and cheese nights in our future. And I’m really liking it. Prepare pasta according to package directions for al dente. Drain, rinse under cold water, and drain again. While pasta is cooking, wash and grate the peel from the lime, then squeeze out 2 tablespoons of the juice; reserve. In a large bowl, whisk together the grated lime peel (zest), reserved lime juice, cilantro (washed and chopped), salsa, sour cream, oil, cumin and black pepper. 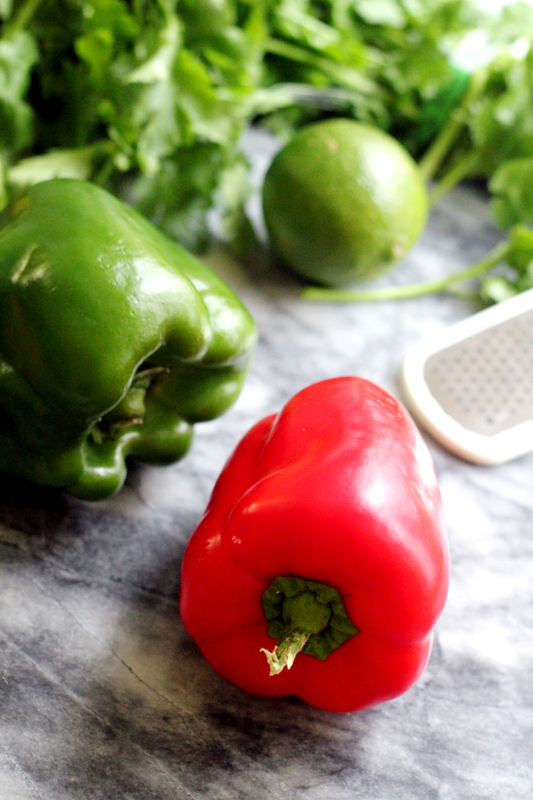 Wash and dice bell peppers. Shred the cheese. Wash and chop the onions. 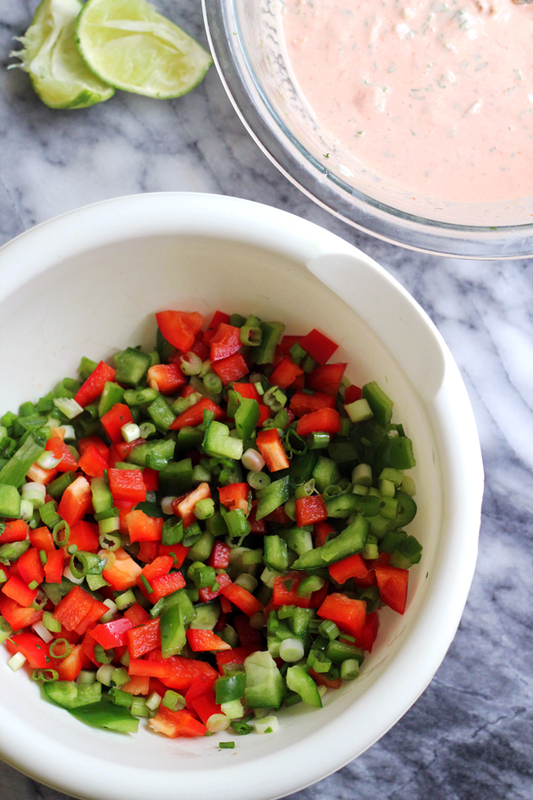 Add the pasta, bell pepper, cheese and onions to the dressing, and toss to combine. Refrigerate until ready to serve. 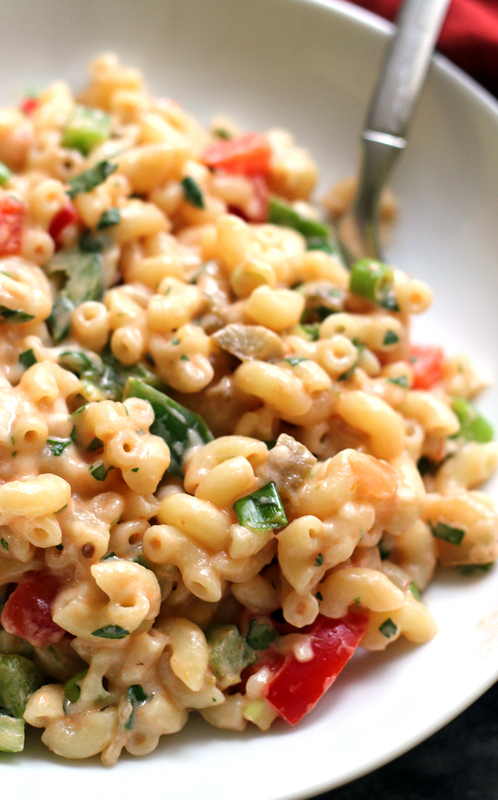 Great idea and yeah, it’s a love child of pasta salad & my beloved Mac and cheese! The peppers give a good crunch and they are just so darned pretty! Holy delicious!! Sour cream AND cheese?! Love it. It’s so gross and gloomy here in Boston, so this has been pinned and will be made in the very near future! PS – this looks delish, of course! Cannot pay full attention to the recipe, even if it’s delish! Hope the whole family is doing awesome! This mac looks amazing! The cilantro, salsa, and sour cream are perfect additions 🙂 Pinning! Gosh, much as I love it, I can’t actually remember the last time I made mac and cheese. I think I just might have to give this version a try before the last of the autumn peppers are all gone. I love mac and cheese in all forms. Now craving Tex-Mex food. Have a great weekend! That looks perfect for taking to cookouts this summer! I’m not the biggest pasta salad fan, buuuut mac and cheese is something I can 100% get onboard with. Loving this! Love it! I think every night should be mac and cheese night! Nice twist on a classic. Looks delicious! How does the cheese get all melted? Or does it not melt? It doesn’t melt! 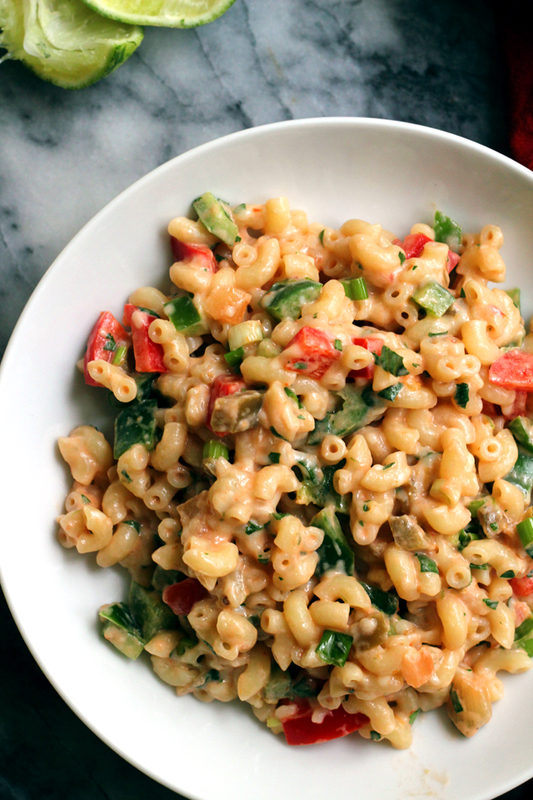 It’s more of a pasta salad than your typical mac and cheese.